Once every month, when the moon is full, they meet to honor the Old Gods. Some meet in deep forests, others within circles of standing stones. Some whisper the names of their gods while others shout defiantly. They are the hidden children of the Old Ones, those who walk the left-hand path, and their magick is ancient. These outcasts stand at the edge of civilization, riding the changing tides of religion and war. Combining the familiar with the unexpected, this Mage: The Sorcerers Crusade book is both a source of new spells and a functional grimoire for your characters. Initiation rites, practical potions, white magick, dark magick and the gray places in-between are all included. 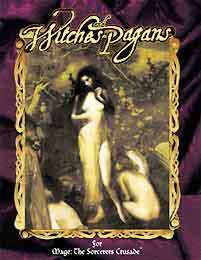 Also, origins of the Verbena, blood rites, storm summoning, Christian witchery, fertility spells and more. >Can't wait for this one to come to PoD. Me too! I love the setting so much. Can't wait for this one to come to PoD. Drivethru is the best.